A bus stop and a station entrance! Wow! Snyder has connections to three bus routes: the 4, running down Broad Street (plus the Broad Street Owl at night); the 79, running down Snyder Ave; and the 37, which goes down Passyunk Ave on its way to the airport and Chester. 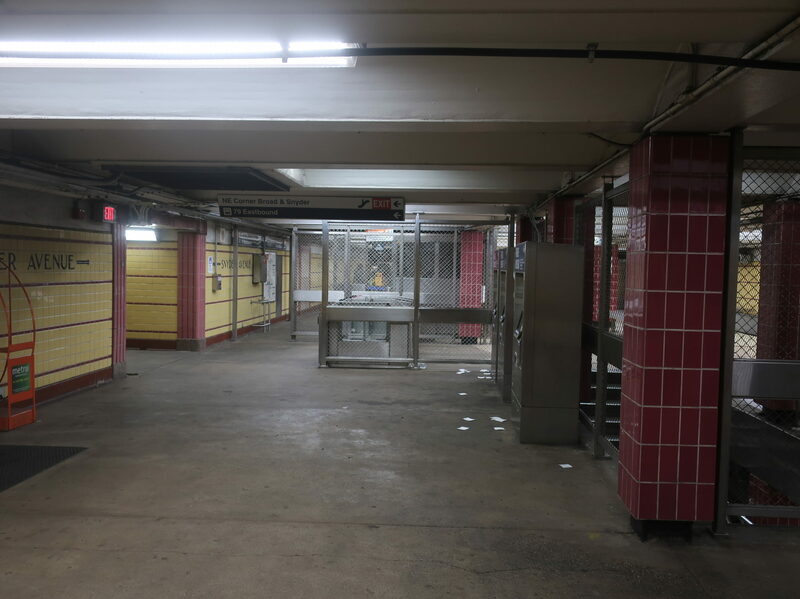 Every single one of these stops has just a sign, except for one shelter at…the northbound 4 stop? Okay, not sure why that’s the one that gets a shelter when the 37 and 79 get exponentially more ridership from here. 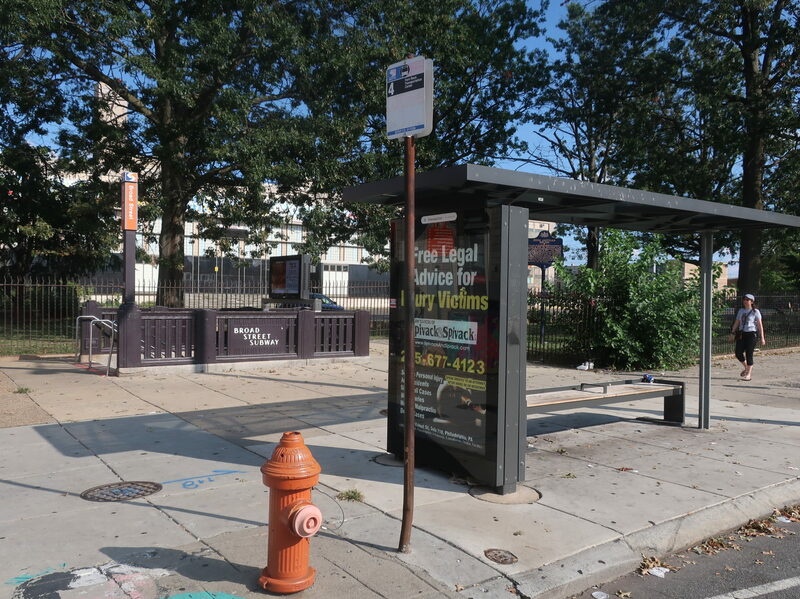 There’s not a lot of room for shelters on Snyder, but south Broad definitely has space for one at the 37 stop. The one bus shelter and its corresponding entrance. Snyder has one entrance on each side of the intersection, for a total of four. They all lead to the same mezzanine, and they’re all really simple staircases down from the street. There is also one exit-only escalator that gets a much more prominent sheltered structure over it. A flowerpot was put on top of it to try to make it look more appealing, but…no, it’s really not. Each of the entrances leads to a claustrophobic passageway that takes you to the mezzanine. Some are longer than others, but none of them are particularly pleasant to walk through. The station also makes a big deal about the fact that you can bring your bikes down to the bike racks in the mezzanine (although according to the SEPTA website, those racks don’t exist), pointing out that two of the staircases feature ramps that you can roll your bike wheels down. They even have these lovely green paths pointing the way, but the problem is…neither of those staircases have ramps. I don’t know if they were vandalized or what, but if you’re gonna park your bikes here, you’re gonna be lugging them down the stairs yourself. Jeez, this looks like a bomb shelter. Yeah, “USE NEXT WINDOW” is right. Past the faregates is the waiting area, which is in view of the cashier, who has “direct contact with police.” So no funny business here! 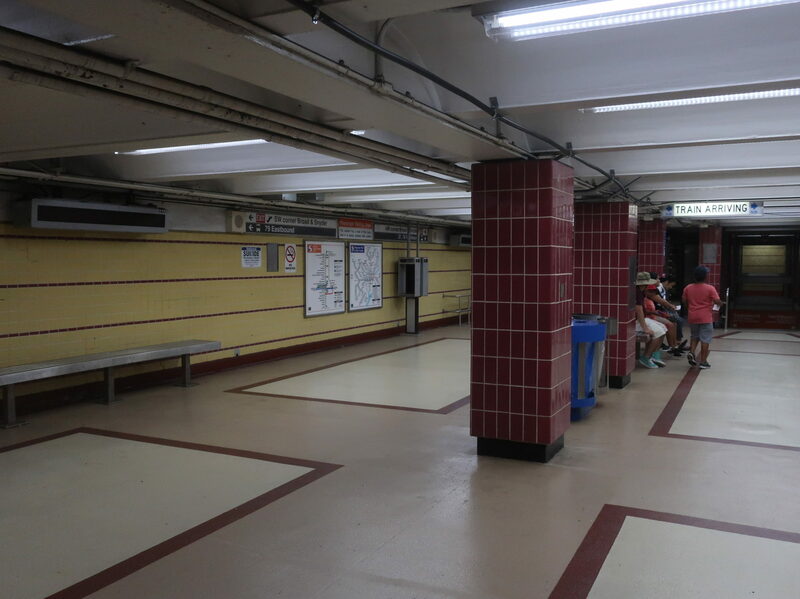 Seriously, though, it’s nice that there’s an area where people can feel safe while waiting for the train – this is common for SEPTA stations. It has plenty of seating space, plus wastebaskets, maps, and a lit-up sign that points out when a train is arriving and in which direction it’s going. The waiting area. That signage is actually great! The actual platform is as underwhelming as I would expect any Broad Street Line platform to be. Staircases lead down to it from the waiting room, and you end up on an island platform with some benches and wastebaskets sprinkled about. There are big industrial fans on each end to keep air circulating. This thing is not trying to look pretty. Exposed random pipes and wires twist around every which way, while the tracks are covered in the characteristic SEPTA grime and trash. The platform itself is clean enough, but everything else combined with the lack of real-time information just makes this an unpleasant place to wait. Also, because of a provision built for an extension down Passyunk Ave, southbound trains have to enter Snyder really slowly. Considering the extension will never ever happen, it’s a little annoying. Yup, nothing to see here. 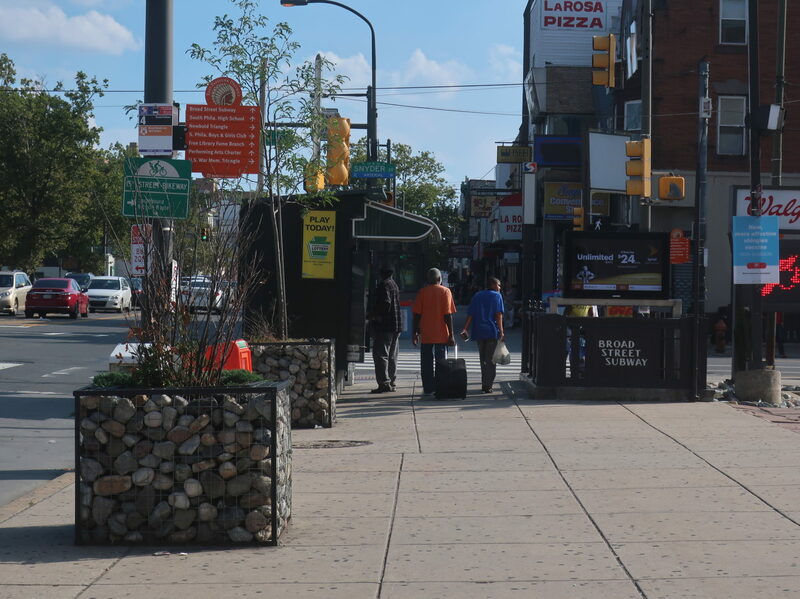 Ridership: Snyder is the busiest station in South Philly, with 5,953 riders per weekday. I’m not entirely sure why that is, but the station is in a really dense neighborhood with a ton of retail, plus two hospitals and the South Philadelphia High School. Cons: The whole station feels cramped and ugly. 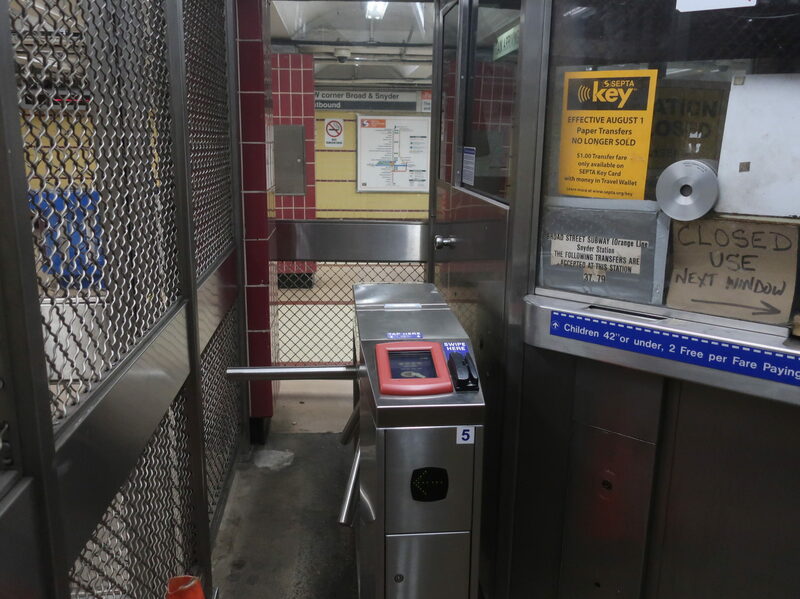 As usual, there aren’t enough faregates for the ridership it gets, and the bus facilities have a similar problem when it comes to shelter and seating space. Also, you wanna know a glaring issue with Snyder that I haven’t touched on thus far? It’s not wheelchair accessible. 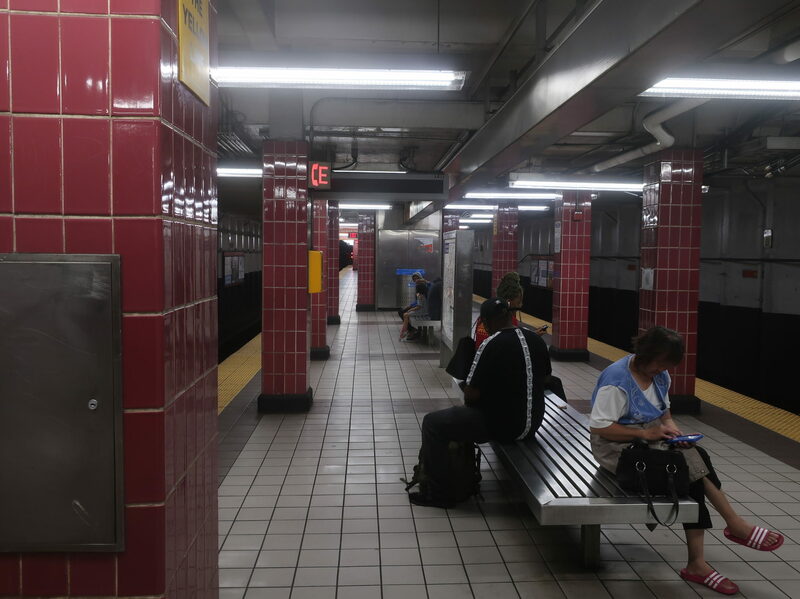 Yes, most of the Broad Street Line stations in South Philly aren’t, but that’s still no excuse. 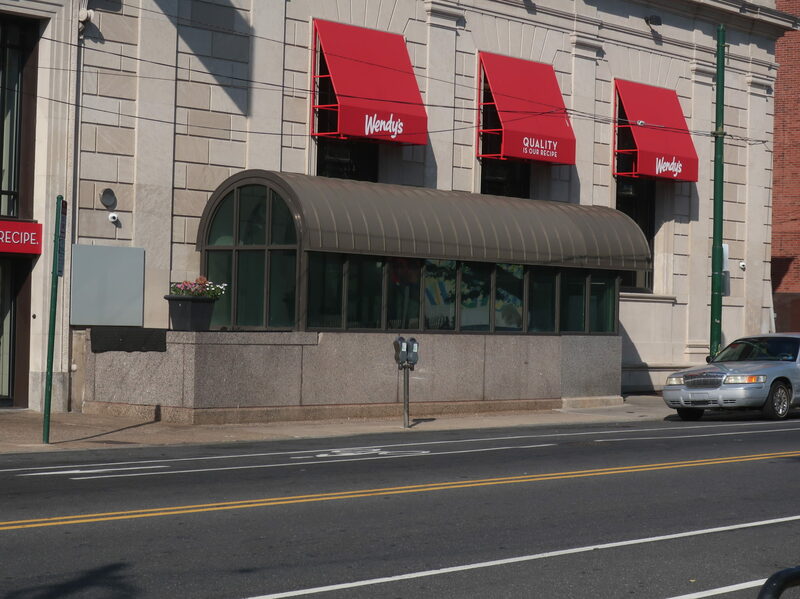 Nearby and Noteworthy: I mentioned the Melrose Diner in my last review, and I talked about the East Passyunk neighborhood in my post on the 45. Also, though I haven’t explored the area yet, there seem to be some funky hidden restaurants a few blocks northwest of this station, including a few breweries, if you’re into that kind of thing (ol’ Miles is underage, of course). 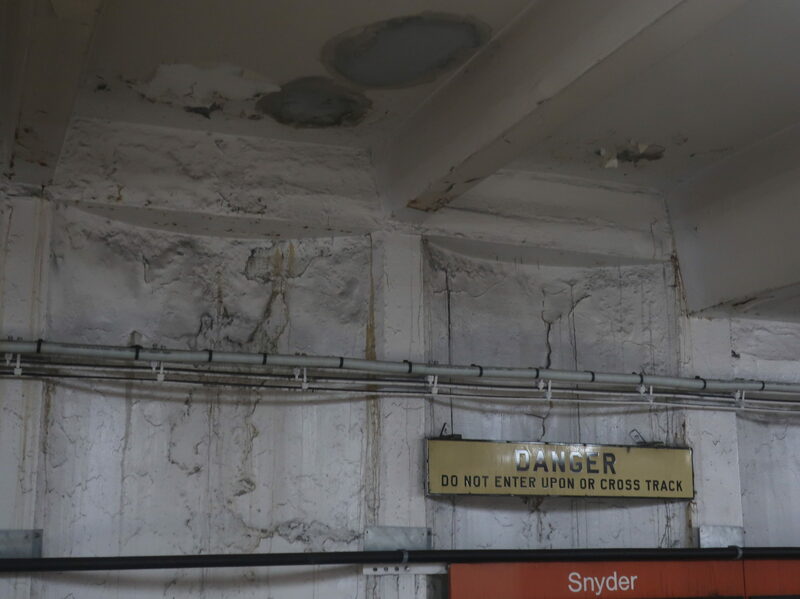 No accessibility, not enough faregates, not even mere benches for the busiest bus stops, and a general feeling of crumbling decrepitness: that’s Snyder. The south Broad Street Line needs an overhaul like what the El got a few decades ago, especially because of the lack of accessibility. There is a ton to do around this station, but if you’re in a wheelchair, tough luck. You’ll have to take (and suffer on) the 4 instead.